The dandelion was originally native to Europe and Asia and records of its use for medicinal purposes by Arab physicians dates back to the 10th century, according to Drugs.com. The plant has been used as an herbal remedy for many conditions, including gastrointestinal problems, joint pain and gallstones. Dandelion tea made from the leaves can act as a diuretic and may aid in weight loss from water retention. Talk to your doctor before incorporating dandelion tea or any other herbal or natural remedy in your diet plan. Dandelion tea can decrease water retention, which can create extra weight. The tea increases urine production, encouraging the body to expel excess water. If you are dieting and trying to lose weight, several of the first pounds you lose will likely be water weight. Natural diuretics, such as dandelion tea, may help you encourage the loss of water weight early in your diet program so that you can continue to lose weight at a safe rate. If you purchase dried dandelion leaves to make your own tea, pour hot water over 1 to 2 tsp. of the dried leaf infusion and steep for five to ten minutes, recommends the University of Maryland Medical Center. Most people can tolerate drinking the tea up to three times per day. It can be difficult to determine the dosage for prepackaged dandelion teabags, so check with your doctor or pharmacist to determine a safe dosage if you prefer to drink store-bought tea. Dandelion tea may also help with poor digestion and high blood pressure, explains the University of Maryland Medical Center. Studies on diabetic mice have shown potential for dandelion to help regulate blood sugar and cholesterol levels. If you have type 2 diabetes or high cholesterol, the tea may help you normalize your blood sugar and increase HDL or "good" cholesterol levels, while lowering your total cholesterol. Stable blood sugar and cholesterol levels contribute to your overall health, which should be your main goal with your diet plan. While you can use the root of the dandelion to prepare a coffee or tea-like beverage, the root can act as an appetite stimulant, which may make it more difficult for you to lose or maintain your weight with your diet plan. Natural diuretics may help you lose water weight initially, but they are not very effective for long-term weight loss, explains Katherine Zeratsky, R.D., L.D. 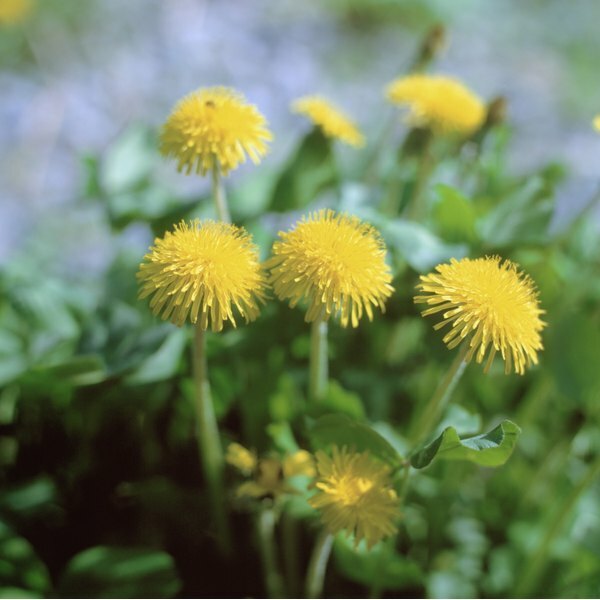 Do not drink dandelion tea if you are allergic to ragweed, daisies, marigolds or chrysanthemums, cautions MedlinePlus. Talk to your doctor before drinking the tea and disclose any medications, supplements and herbs you currently take. Dandelion may cause adverse reactions in people who take lithium, diuretics and drugs that are broken down in the liver. Stop drinking dandelion tea if you are taking antibiotics, since it may decrease how much of the medicine your body absorbs. Does Hot Tea Make People Lose Weight?